The winters of 2017-18 and 2018-19 brought us slow-moving hot stove seasons that resulted in many free agents signing smaller than expected contracts. In some cases, free agents aren't getting contracts at all (Dallas Keuchel and Craig Kimbrel). The second and third tier free agents have had it the worst. MLB teams have successfully trimmed player spending -- the average salary declined for only the fourth time in the last 50 years in 2019 -- and, as a result, many players are now jumping on long-term yet below-market contract extensions. Can you blame them? That big free-agent payday is not guaranteed to be there now. Cash in while you can. Nolan Arenado, Rockies: 8 years, $260 million. Chris Sale, Red Sox: 5 years, $145 million. Paul Goldschmidt, Cardinals: 5 years, $130 million. Aaron Hicks, Yankees: 7 years, $70 million plus one club option. Miles Mikolas, Cardinals: 4 years, $68 million. Justin Verlander, Astros: 2 years, $66 million. Sonny Gray, Reds: 3 years, $30.5 million plus one club option. Ryan Pressly, Astros: 2 years, $17.5 million plus one club option. What was once a strong free-agent class has thinned out. Those slow-moving 2017-18 and 2018-19 offseasons have led to some very good players taking themselves off the 2019-20 free-agent market entirely. Extensions have impacted future free-agent classes as well -- Alex Bregman, Blake Snell and Mike Trout all recently signed deals that buy out free-agent years -- so the domino effect is real. Free-agent spending is down and players have noticed. "I kind of saw what Bryce (Harper) and Manny (Machado) went through and it drew a red flag for me," said Trout to reporters during his contract extension press conference this past weekend. "I talked to Manny and Bryce. It was a tough couple months in the offseason. They put it in perspective in my mind. I obviously want to be an Angel for life. That was a big key." The best player in the game, at the height of his powers at age 27, saying the free agencies of two other prime-aged stars "drew a red flag for me" despite record revenues tells you all you need to know about free agency right now. It is broken, and teams have leveraged the broken free-agent market into club-friendly extensions. Expect more impending free agents to take themselves off the market between now and November. Elvis Andrus, Rangers: Won't opt out of final three years and $43 million. Jake Arrieta, Phillies: Won't opt out of final year and $20 million. Aroldis Chapman, Yankees: Won't opt out of final two years and $30 million. Yu Darvish, Cubs: Won't opt out of final four years and $81 million. Yasmani Grandal, Brewers: Will decline his half of his $16 million mutual option and test free agency. Kenley Jansen, Dodgers: Won't opt out of final two years and $38 million. J.D Martinez, Red Sox: Will opt out of final three years, $62.5 million and test free agency. Stephen Strasburg, Nationals: Won't opt out of final four years and $100 million. 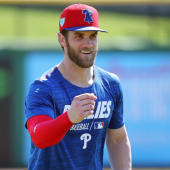 Chris Archer, Pirates ($9 million); Matt Carpenter, Cardinals ($18.5 million); Nelson Cruz, Twins ($12 million); Sean Doolittle, Nationals ($6.5 million); Corey Kluber, Indians ($17.5 million); Starling Marte, Pirates ($11.5 million); Jose Quintana, Cubs ($11.5 million); Anthony Rizzo, Cubs ($14.5 million) will have their club options exercised. Here, as the 2019 MLB regular season gets underway, are the top 10 players scheduled to become free agents next offseason. Weekly free agent stock watches will follow between updated rankings each month. Surprised? You shouldn't be. Xander Bogaerts had a chance to top this list even before the Arenado, Goldschmidt, Sale, and Verlander extensions. He won't turn 27 until October, so whichever team signs him will buy peak years in bulk, and Bogaerts has already proven himself as a middle of the order force for a championship team. Add in the fact he plays a premium position and you have a player poised to land the offseason's largest contract. The x-factor: How much will teams ding Bogaerts for his defense? The various advanced metrics haven't liked his work at shortstop the last few years. Even then, he would slot in nicely at third base, a position he's played in the past. Expect the Red Sox to push hard for an extension before Bogaerts hits the market. The Sale and Verlander extensions leave Gerrit Cole as the lone undisputed ace in the free-agent class. Cole will turn 29 in September and he showed last year that he can be a front of the rotation guy in the American League. He has peak years remaining and his power arsenal is exactly what teams value in the modern era of baseball. Expect agent Scott Boras to drive a hard bargain next winter now that Sale and Verlander are not available as top of the rotation alternatives. I imagine we'll hear Max Scherzer's seven-year, $210 million contract (also brokered by Boras) referenced with Cole. Anthony Rendon is sitting pretty right now. The Nationals just lost Bryce Harper to free agency, and even with wunderkinds Juan Soto and Victor Robles emerging, it's awfully hard for me to believe they'll let another homegrown MVP caliber producer leave after the season. Rendon is excellent on both sides of the ball and a player capable of being The Man in a contender's lineup. You can build around him. Two things might work against Rendon: He'll turn 30 three months into the 2020 season, and he dealt with some pretty serious ankle injuries early in career. These days, teams will use anything and everything as leverage during contract talks. Oh, and by the way, Rendon is another Boras client. Boras represents Bogaerts, Cole, and Rendon. He controls the top of the market. The expectation here is J.D. Martinez (another Boras client!) will indeed opt out of the three years and $62.5 million remaining on his contract following the season. At the very least, I expect him and Boras to try to leverage the opt-out into an extension with the Red Sox. Martinez is a top three hitter in baseball, so, even with an injury history and his 32nd birthday coming up in August, plus defense that will likely relegate him to DH as he ages, he's still poised for a big short-term payday. I don't think a Verlander-esque two-year deal at $66 million total is out of the question with another 2017-18 caliber season in 2019. Either way, the important number here is $62.5 million. As a free agent next winter, I expect Martinez to beat the $62.5 million he would walk away from by using the opt-out. I'm not sure any impending free agent has more to gain with good health and good performance than Zack Wheeler . Tommy John surgery and subsequent setbacks kept him out of action in 2015 and 2016, and, when he returned in 2017, he wasn't good (5.21 ERA in 86 1/3 innings). Last season Wheeler, who will turn 29 in May, finally broke out following the injuries, and managed a 3.31 ERA in 182 1/3 innings. His 1.68 ERA in the second half last year was better than teammate (and reigning Cy Young winner) Jacob deGrom's (1.73 ERA). The four-year, $68 million contract the Red Sox gave Nathan Eovaldi (another guy with a long history of arm problems) this offseason seems like a good contract benchmark for Wheeler should he turn in another strong, healthy season. With more injuries, he might have to settle for a one-year "prove yourself" contract. Ranking Yasmani Grandal this high feels bold after he struggled to find work this past offseason. He wound up with a one-year contract that will be worth $18.25 million total once he declines his half of his $16 million mutual option for 2020. (Both sides have to pick up the option for a mutual option to kick in.) That said, Grandal reportedly had multiyear offers, and I think a switch-hitting catcher with power and great pitch-framing numbers will be able to top $16 million in free agency next winter, even if it is across two or three years. Grandal turns 31 in November and that's not so old that getting multiple years will be impossible. Betting on himself with a one-year deal might work out quite nicely for Grandal. Based on his reputation, Madison Bumgarner belongs somewhere in the top three spots in these rankings. Based on the pitcher he is today, he probably wouldn't have cracked the top 10 if not for all those extensions. Bumgarner has shown a marked decline in velocity in recent years, as well as in his strikeout, swing and miss, and hard contact rates. Bumgarner isn't missing as many bats as he once did, and when hitters do make contact, they're hitting the ball harder than at any other point in his career. Teams have removed emotion from their player valuations, so Bumgarner's postseason history probably won't equal big bucks. With his 30th birthday coming up in August and all those innings on his arm, my hunch is teams are worried Bumgarner is about to enter a Felix Hernandez -esque decline phase. Some team will pay him, probably the Giants with an extension, and I'd bet on the contract being smaller than the name value might lead you to believe. Before his extension I had Verlander penciled in at No. 2 on this list because he's still excellent, and because his age ensured he'd sign a short-term deal. Teams love short-term deals. Cole Hamels , who will turn 36 in December, now stands out as the offseason's best "high-end pitcher on a short-term deal" free agent. He's not Verlander, and there's little chance he'll repeat his 0.7 HR/9 across a full season with the Cubs in 2019, but he's very good and he's as good a bet for 30 starts as anyone in the game. All the teams that were looking forward to making Verlander a big money two-year offer will presumably pivot to Hamels, and offer him a smaller two-year deal. We're now starting to see how much the 2019-20 free-agent class has been thinned out by extensions. Tommy John surgery will keep Didi Gregorius out until midseason -- he could return as soon as June or as late as September -- so his track record as a dynamic shortstop who has improved every year at the plate will have to do the heavy lifting come free-agent time. With a healthy return and, say, 200 plate appearances that look like 2017-18 Gregorius, Sir Didi's stock shouldn't be hurt too much. The injury is going to take a bite out of his earning potential though. There's no doubt about that. My money's on the Yankees and Gregorius working out an extension before he ever hits the open market. What was set to be a big contract year will instead begin with a stint on the injured list. Scooter Gennett suffered a fairly serious groin injury this past weekend and it's expected to keep him out until mid-to-late May, maybe even June. That's a bummer. Gennett has emerged as a comfortably above-average second baseman the last two seasons, especially offensively, and he turns only 29 in May. He should have still be several peak years remaining. The injury timetable indicates Gennett should still get 400 plate appearances or so this season to show he's an impact middle infielder. The Next Five (alphabetically): OF Nicholas Castellanos; 3B Josh Donaldson; SP Rick Porcello; OF Marcell Ozuna; OF Yasiel Puig.